Chamomile pickled baby gold potatoes with a seaweed butter sauce. The perfect balance of sweet, salty, umami and acidic. Pickled anything is a big win in our house. Pickled beets? Yes. Dilly beans? Hell yes. Pickled garlic (trust me, you need it if you like bloody marys). Pickling is a great way to brighten a typically heavy dish, either by adding pickled things as a topping, or working it into the base. And if you're slightly unsure about this, I would advise you to go in with faux confidence and really trust this. It's very, very good. 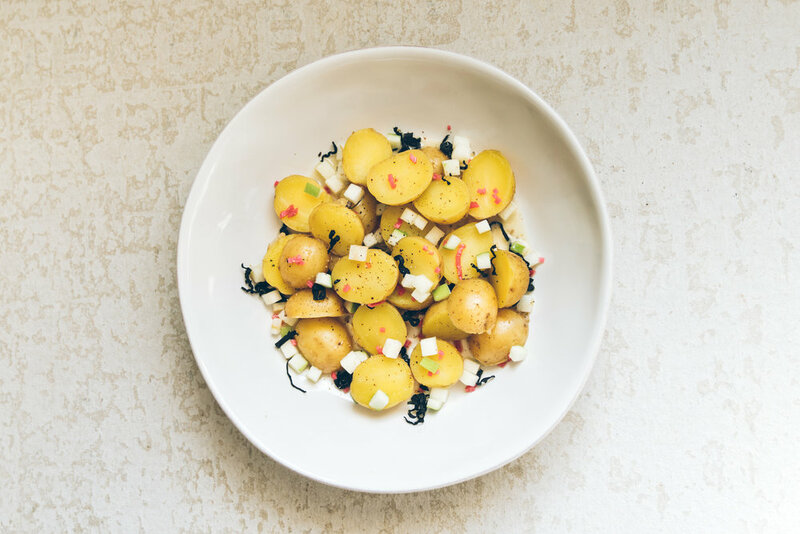 This recipe is adapted from Saveur's recipe for Chamomile pickled new potatoes. It came out in an issue about Denmark, right before we went to Denmark...thereby only fanning the adoration flame that we have for all things Denmark. Especially the food. When I saw this recipe we figured out how to change it up a bit with seaweed. Yep. Seaweed. In actuality, seaweed is just a great, normal-not-scary- ingredient that brings in salty and umami flavors to a dish. Don't get hung up on the fact that it's grassy ocean slime. It's a tool. Use it. So while the original concept from the magazine is highly bright and acidic (pickled potatoes plus a beurre blanc sauce--essentially vinegar/dry wine/shallots and butter), we toned it back and made it more comforting. More mellow. The base sauce now contains kelp puree and it's topped with dry shredded wakame seaweed. It's a nice crunchy topping. Like seaweed croutons? And yes, part of this was made out of a fridge clear out necessity (I don't know how we acquire so many condiments). But when you're trying to use up a bunch of toppings and pastes it certainly makes you see things differently. The chamomile pickling process is sort of a quick pickle with a floral aromatic bonus. I thought keeping the chamomile pickle from Saveur's was important since I was already bastardizing the rest of the recipe with all sorts of ocean greens the first go round. I think there's an opening here to maybe do a tea pickle, but that's for another day. Add potatoes and cover with water in a pot with a lid. Add 1 tablespoon kosher salt. Cover and bring to a boil. Cook covered on low for an additional 5 minutes. Remove from heat. Drain and run under cool water. Cut potatoes in half. In a small pot add water, vinegar, sugar and salt. Bring to a boil. Stir to dissolve sugar and salt. Remove from heat. Add dried chamomile. Stir and set aside. Add halved potatoes to pickling liquid. Cool to room temperature, about 2 hours. To make sauce In a medium pot, add the shallot and wine. Boil on high to reduce liquid to about 1/4 cup. This should take 8-10 minutes. Reduce heat the heat to medium-low and start adding cubed butter a few cubes at a time. Whisk quickly and constantly while adding to incorporate butter completely before adding more. Do this until all the butter is added and the sauce becomes thicker and opaque. Remove the pot from the heat. Stir in seaweed puree. Add salt and pepper to taste. To plate add sauce to the bottom of a serving platter and add drained potatoes and top with dried wakame. My preference is to remove any stems/pickled chamomile from the potatoes before plating, although note, the images show the final plate garnished with additional chamomile. An alternative plating method more suited for group serving would be to drain the pickled potatoes and any chamomile parts stuck to the potatoes. Toss with sauce in a bowl and top with dried wakame. Side note: Below is the first version of this recipe we went with- it involved adding picked ginger (delicious) and green apple (also delicious) but the result was just so weirdly bright confetti looking I knew it wouldn't draw you in to consider making it.